Mixers can make a huge difference in the overall success of any project. For those that have mixing needs, the BNR7000 TwinMaster™ Mixer is a great option. This mixer is high powered, easy to use, and will effectively mix any medium you may be working with to perfection. The BNR-7000 TwinMaster™ Mixer has an innovative and newly designed mixing paddle that can cut through any medium that you are mixing. Paired with a powerful 1400 watt power mixer that has the ability to spin the mixer in two different directions at the same time, this mixer is certainly a cut above the rest. The dual direction spin of the paddle helps to eliminate bucket spin while using your standard 5 gallon mixing container or a larger container if need be. This mixer comes with two different mixing paddles that are perfect for use with just about any mixing medium. Epoxies, cement, mortar, plaster, paint, high viscosity material, and much more can all be mixed with one of the two paddles that are included. The paddles are designed with all mediums in mind and allows for a quick and easy mixing on the job. This can be used both on the job and with home projects. 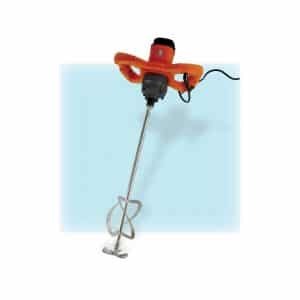 Also, the mixer can be used with small jobs and with larger jobs. It is certainly a great option for those that need a great mixer that is going to work with a wide range of needs and jobs. The BNR-7000 TwinMaster™ Mixer comes with a variable speed motor so that you can get the perfect mix every time no matter what you are mixing. The no load speed of the mixer is 270-460 rpm and the motor type is double insulated for added protection. The paddle is 5-1/2” and is designed to spin in two directions at once to eliminate bucket spin and to help mix your medium entirely. The overall weight of the mixer is just under 17 lbs for easy transport and use so that just about anyone can use it. Voltage of this mixer is 120V/60Hz and the power is 1400W/11.7 Amps. The gear box has one setting. This mixer can be used in just about any medium and can be used for a wide range of uses. If you are looking for a great compact mixer this is one that fits the bill perfectly. This mixer is great for all users and for just about any job that you have. If you are in need of a great mixer that can be used for a wide range of jobs and for a wide range of mixing mediums, the BNR-7000 TwinMaster™ Mixer is one that you should consider. This is a great mixer that can be used for a wide range of jobs and for a wide range of job sites. This is a great mixer for just about any job and can be used with a wide range of materials so it can be used in construction, flooring, and more.